A brief description of the Jerusalem Tumuli follows. Nineteen or twenty tumuli (tumulus [singular] = a mound of dirt) have been found in what are now the western portions of modern Jerusalem. 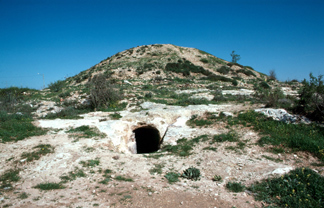 Gabriel Barkay, drawing upon parallels from Cyprus, has argued that these mounds mark the locations of the places where ceremonial burnings (2 Chron 16:14; 21:19; 32:33; Jeremiah 34:5) were made to lament the death of the Judean kings and/or dignitaries. The tumuli date from the eleventh through the sixth centuries B.C. Barkay has suggested, based upon the archaeological finds and parallels from Cyprus, that (straw) effigies of the deceased were ritually burned on a stone platform, and then a mound of dirt (tumulus) was deposited over the site by the participants in the ritual. Please see his recent article noted below. To view a photo of Professor Barkay Click Here or Here. Barkay, Gabriel. "Mounds of Mystery — Where the Kings of Judah Were Lamented." Biblical Archaeology Review, vol. 29, no. 3 (May/June, 2003): 32–39, 66, and 68.